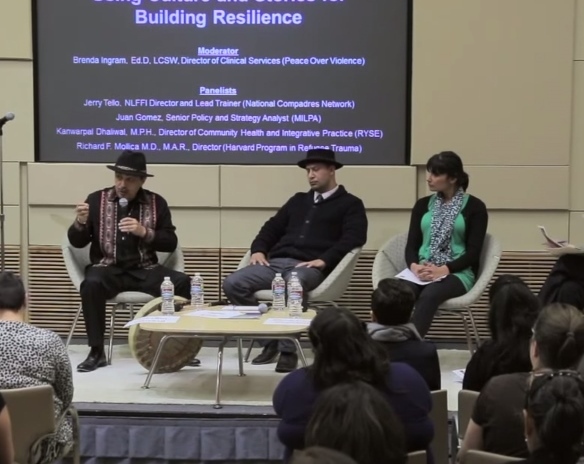 The Healing Together event on January 29, 2015 at The California Endowment’s Center for Healthy Communities nurtured a compelling conversation on trauma, healing, and hope, and carried a strong and loving charge for transformation and justice. Maestro Jerry Tello initiated the panel discussion with the salient call to heal together as traumatized people, traumatized communities, traumatized organizations, and traumatized systems. Culture and stories at all these levels need to be expressed, listened to, and validated in order to heal and transform, and to enable our collective will and capacity to take the risks that transformation requires. Another central point raised during the panel was that trauma impacts all of us, AND with differentiated empathy, validation, and response between structurally privileged and structurally vulnerable communities. Histories and legacies of oppression, exploitation, and unearned entitlement are themselves traumatizing and too often unnamed, yet replicated, in our assumptions, practices, policies, and investments to address trauma, support healing, and promote equity. So how do we change this? Shifting our conventional notions of success and achievement of programs to heavy and sustained investments in people and relationships, as well as on-going learning and culture-building were just a few of the opportunities named. The RYSE Youth Center works to elevate and give primacy to the lived expertise and narratives of young people of color in Richmond and West Contra Costa County. We work to ensure their dynamic priorities, needs, interests, hurts, healing, grieving, dreams, hopes, talents, skills, and aspirations are integrated and coordinated within and across all programs, systems and stakeholders responsible for their well-being. Last year, RYSE conducted a community-engaged inquiry process seeking understanding of the experiences of violence, trauma, coping, and healing for young people. The results of this effort, called the Listening Campaign, engaged over 450 young people. What we heard from our community is that trauma is pervasive, assumed, and multi-dimensional; organized through silencing and shaming, mediated through substance use and harm to self and others, and reinforced through judgment and punitive experiences by adults. At the same time, young people expressed the need and desire to form trusting relationships with adults and to have more spaces where they are listened to and recognized as human beings. In our commitment to acting on the needs and insights that young people shared in the Campaign, RYSE undertook an endeavor called the Trauma and Healing Learning Series. This series bring together adult stakeholders to consider and address the impacts of trauma and oppression on young people, their families, and communities. The series supports opportunity and urgency to create shared language and commitment to collective practice, mutual accountability and support in implementing and sustaining trauma-informed, healing-centered approaches, practices, and investments. The launch of our 2015 Series begins next week and starts off with a 2-part session on adolescent development, trauma and the brain, and the importance of risk-taking for young people and the organizations that serve them. For more information and to register for our Getting Risky Workshop series, please visit the following link: Getting Risky.